For those of a similar name, see Edward Chamberlain (disambiguation). Edward Hastings Chamberlin (May 18, 1899 – July 16, 1967) was an American economist. He was born in La Conner, Washington, and died in Cambridge, Massachusetts. Chamberlin studied first at the University of Iowa (where he was influenced by Frank H. Knight), then pursued graduate-level studies at the University of Michigan, eventually receiving his Ph.D. from Harvard University in 1927. For most of his career Edward Chamberlin taught economics at Harvard (1937–1967). He made significant contributions to microeconomics, particularly on competition theory and consumer choice, and their connection to prices. 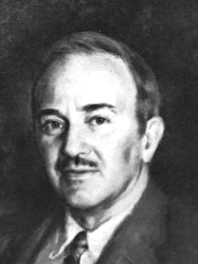 Edward Chamberlin coined the term "product differentiation" to describe how a supplier may be able to charge a greater amount for a product than perfect competition would allow. In 1962 was admitted as corresponding academician to the RACEF. His most significant contribution was the Chamberlinian monopolistic competition theory. Chamberlin published his book The Theory of Monopolistic Competition in 1933, the same year that Joan Robinson published her book on the same topic: The Economics of Imperfect Competition, so these two economists can be regarded as the parents of the modern study of imperfect competition. Chamberlain's book is often compared to Robinson's book The Economics of Imperfect Competition, in which Robinson coined the term "monopsony," which is used to describe the buyer converse of a seller monopoly. Monopsony is commonly applied to buyers of labour, where the employer has wage setting power that allows it to exercise Pigouvian exploitation and pay workers less than their marginal productivity. Robinson used monopsony to describe the wage gap between women and men workers of equal productivity. Chamberlin is also considered one of the first theorists who applied the marginal revenue idea, which is implicit on Cournot´s monopoly theory in the late 1920´s and early 1930´s. Chamberlin is thought to have conducted "not only the first market experiment, but also the first economic experiment of any kind," with experiments he used in the classroom to illustrate how prices don't necessarily reach equilibrium. Chamberlin concludes that most market prices are determined by monopolistic and competitive aspects. Chamberlin's theory of monopolistic competition is used by sociologist Harrison White in his "markets from networks" model of market structure and competition. The works of Chamberlin, Robinson, and other contributors to the Structure-Conduct-Performance Paradigm were heavily discounted by game theorists in the 1960s, but Nobel-Prize winner Paul Krugman and others built the foundations of the New Theory of International Trade by combining such theories of industrial structure with production functions that assumed significant economies of scale and scope. "The Theory of Monopolistic Competition: A Re-orientation of the Theory of Value", Harvard University Press, 1933 1st ed. & 1962 8th ed. ^ "Pigouvian Exploitation of Labor". JSTOR 1927526. ^ a b Brue, Stanley L.; Randy R. Grant (2008). The evolution of economic thought. Thomson. p. 543. ^ Ross Miller (2002). Paving Wall Street: Experimental Economics and the Quest for the Perfect Market. New York: John Wiley & Sons. pp. 73–74. ISBN 0-471-12198-3.